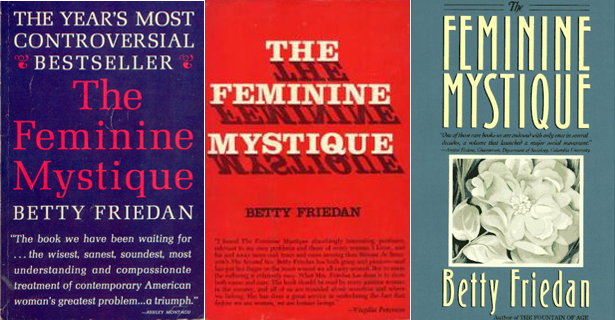 A couple of weeks ago, historians and activists celebrated the 50th anniversary publishing of The Feminine Mystique by Betty Friedan. As a feminist and a history geek, I certainly appreciate the importance of this book to the American women’s rights movement. Not unlike other women of color feminists who have made similar commentary, as a millennial black feminist, and daughter of immigrants, the Feminine Mystique has never served as a relevant part of my life or that of many of the millennial activists I know. At the time The Feminine Mystique debuted, single women did not have a legal right to birth control. Married women did not have joint access to credit or their bank accounts with their husbands. In the recent PBS Documentary Makers, Sarah Weddington , who at 26 years of age successfully defended Roe v. Wade before the Supreme Court, remembered being told that despite the fact she was putting her husband through law school, she needed her husband’s permission to get a credit card. Thanks to the TV show Mad Men, we now know, sexual harassment of women in the workplace was accepted as an every day reality. Abortion was illegal. Domestic violence was a dirty family secret, where shelters didn’t exist to protect women from their abusers. I understand how monumental the infamous “problem that had no name” Betty Friedan wrote about was to white middle and middle upper class women. She spoke of the inexplicable malaise that afflicted women who had the training and education to be something outside the home but were expected to be unquestionably happy with home making when in reality many were not. Rather than voice their unhappiness they mostly suffered in silence. To them, her writing was a relief; an affirmation of the moments they doubted their sanity. For women like my mother and my mother in-law it would not have supplied either and would have been nearly a foreign language. My mother, an African woman, grew up in a small village in rural Africa in the 1950s. The fate of women in her family (not unlike many African women today) was to get married as a teenager and have many children (since there was no contraception). My grandmother was married and had her first child, my mother, at age 15. My grandmother sold items at the marketplace and got up at dawn every day to till the farmland. Not working was never an option in an economy driven by agriculture. My mother found her feminism through pursuing more education so she could work in medicine and help her community. My mother knew education was the only way to have choices in her life. My grandmother who was illiterate helped convince my grandfather, who was set on marrying my mother off when she reached the appropriate, that this was the best thing for their daughter. Across the world, my husband’s mother grew up in a white working class Texas home. Her father was a man of his generation who believed the wisest use of the family’s scarce resources was to send his son to a university and his daughter to secretarial school. Although my mother-in-law had earned much higher scores on the SAT than her brother and had been recruited to study engineering and physics by universities, she went to “business school” and then got married right away because a woman wasn’t supposed to stay single in those days. Although she was white, my mother-in-law’s class status and gender combined to obstruct her chance to be the working professional she could have been. She found her way to feminism because of the continued sexist and misogynist experiences of working in the offices of Texas businessmen in the 1960s. By marrying one of her bosses, she learned the ins and outs of running a business and decided she could do it pretty well herself. It was then she found her talent and the best way she could give her only child, my husband, a great education and opportunity at life. Betty Friedan and the women like her who ignited the modern American women’s rights movement never spoke to them or their lives and circumstances as women of color and working class white women. That glaring omission seems to resonate more today with my generation. According to research compiled from the U.S. census bureau, around forty percent of the millennial generation is African American, Latino, Asian or of a racially-mixed background. Twenty percent have at least one immigrant parent. As a result, more women and men of the millennial generation will have grown up in a household where the Feminine Mystique was not relevant historically to the women of their family. A fellow activist and friend who grew up in a white working class family told me of her mother’s fight to get an education, and how feminism only made sense to her mother as survival. In turn, feminism saved my friend through her Daddy issues, abusive relationships, coming out as a lesbian, and questioning how the loving Christian God with whom she was raised would ever believe in the second-class status of women. Young women of color like myself are awakened to discrimination early in life in part due to our race but we also realize that race solidarity disintegrates when gender is put to the test. We learned that feminism mattered to us, when even if the situation wasn’t about race discrimination we couldn’t escape gender discrimination. The women in my family and that of my fellow activist friends may find Betty Friedan and her co-horts experiences irrelevant to our personal journeys to feminism, but Betty Friedan’s reach with The Feminine Mystique is relevant to launching a modern American women’s rights movement that did transform their lives and ours. ← Are We Being Too Harsh on Women Execs Like Mayer and Sandberg?